After taking the overnight train from Brussels and arriving in Munich at 6:30 a.m. on Tuesday morning, seeing much of what there was to see before any proper Belgian would even be awake, finding a hotel, having breakfast (and then taking a nap), we set out for more sightseeing in the light snow and rain that was falling. The cold weather and the exhausting day made glühwein (hot spiced red wine) a sensible afternoon beverage. We then took advantage of our hotel's central location to head to the ever-popular Hofbräuhaus, where we indulged in beer, pretzels, beer, sausages, beer, sauerkraut, beer, potato salad, beer, random meats, and, oh yeah, beer. By the end of the night, we were singing, slamming things down on the table (well, this was instigated by Mom's friend sitting across the table from her), laughing, and having an overall swell time. 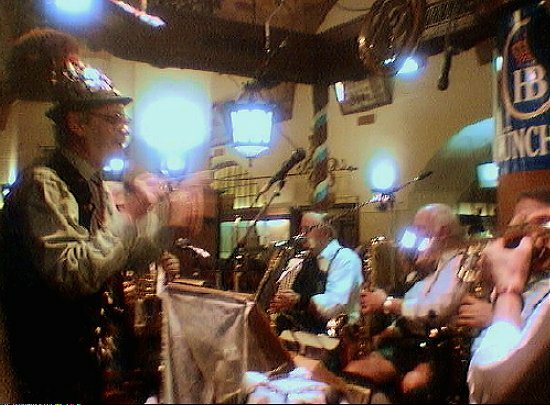 Click on the picture of "The Maestro" for other Hofbräuhaus pictures. 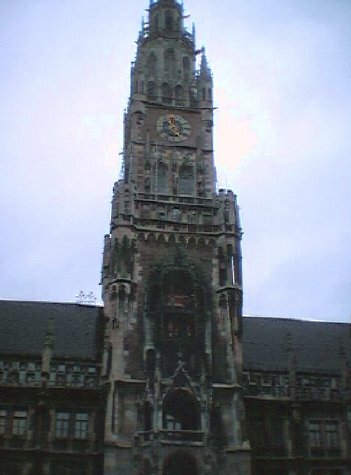 This is the old town hall on Marienplatz in Munich. At 11:00 a.m., 12:00 p.m., and 5:00 p.m., if I am not mistaken about the times, the carillon plays and the figures in the tower "dance" around. It is not uncommon for people to be gathered in the square waiting for the spectacle at other times throughout the day; however, before growing too impatient, they can easily stroll over to the tourist information center on the square to find out what the correct hours are. 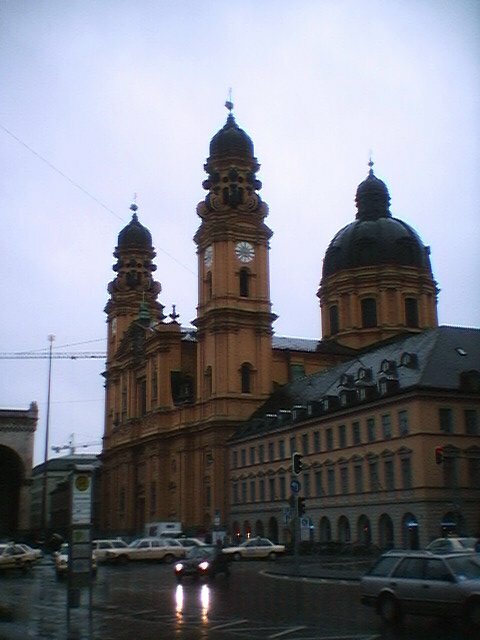 What we saw more of in Munich than anything else: churches. This is probably due to the fact that we arrived well before most things besides churches were open. At any rate, here's one. George and David lugging the bags around....still carrying the curlers even though they had "technical difficulties" the night before and would not make the rest of the trip. Return to the JOURNAL page. Return to the GERMANY & SWITZERLAND page. This page was created by David M. Rojas and last updated on Tuesday April 06, 1999.